Looks interesting. any idea on when we will have a playable demo? You sir, have some amazing potential. i watched you 'weathertech demo' and i was completely shocked at how in-depth you got with generating random weather. that fact alone has given enough convincing to play anything you create. keep doing what you do man. its working! You just made my day! I've always been into simulation. It adds depth to the world one plays in, and that's what I want for my game. TWIGGY FRUIT because, why not. The other fruit is called Toronja, as you can see in the video. The background stories for these names are actually funny xD. So a few years ago I was working with other fellas on an online, browser based, exploration and collection game. Indie style. Like many ambitious indie games, it fell apart on it's own demands. However, there is a lot of knowledge learned from that which I get to apply now to Cognition. For that, I am glad. One of the things you could do in the game, is discover plants and harvest them. Once I drew the first one (red one), one of the devs laughed at it and said "What's that?? A grapefruit?". Not so funny, but in spanish it's Toronja, and maybe it was the way he said it, but it was plain hilarious. That's how that fruit got named so. 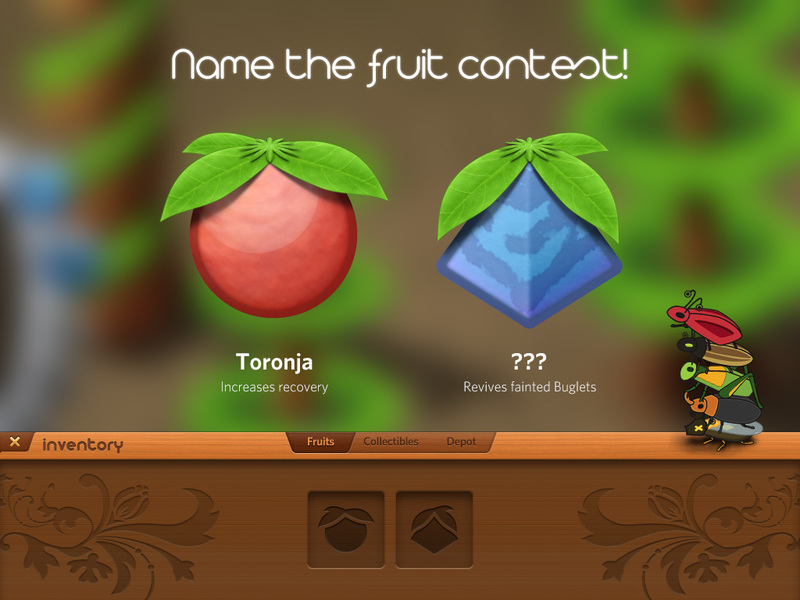 Once I drew a second fruit, we didn't know what to name it, and decided to leave it to the followers of the project. We made a post on Buglets (our game) Facebook page and asked people to name it. Many ideas came about (including blue meth :|) until someone said something like twiggy or similar. We just adopted it as Twiggy because it's cute, charming and funny, all in one. And that's the origin of the fruits' names even if it sounds silly, they got a ton of history attached which I cherish. Once I had to implement fruits on Cognition, those two had to be in. This is wonderful! I really love your weather system in this. I think it'll really make for some interesting locations, and events. Who knew that Twiggy Fruit had such a deep, full yet unknown history...? Hey guys thank you all for your replies. The next video is slightly farther away than I thought it'd be, so here are some quick updates. We now got simulation units (simulation embed in one object, like campfires) and data layers (photons, heat, ground water...). It will enable a lot of optional experimentation for players and makes everything more realistic. More on this on the next video. Also, I got around some stuff like energy depletion. Now it will load and auto-save made at the last "safe area" for you to figure out again how to survive trough that segment. Segments can be really short, specially at first, so the reiteration time should be little. Once most basic features and mechanics are ready to be used, I will continue to make the explorable maps. Oh! And the story too!! This survival concept sounds pretty good, it makes a good change from the typical rpg games made using this program. I look forward to experiencing the gameplay for myself. Keep up the good work! All right guys. I'm currently testing what I call the "Tutorial map". It's a fairly larger map than others, where main mechanics are introduced in what I believe is a good pacing. Fighting, equipping weapons & skills, harvesting, exploration and crafting. Most importantly, I've been having fun and enjoying the few minutes of gameplay that is available. Which is surprising as game testing can get repetitive. The underlaying engine is working well now. I was so excited when the campfire provided light and warmth during the night - all through simulation! While I won't be releasing a demo yet, I will soon upload a video showing the latest stuff and a well rounded gameplay footage. This is happening! Contracts on creating something that has others excited. that is a great feat all in its self. Im looking forward to seeing the 'tutorial map' video. you are an inspiration to us all. i wish i had time to learn ruby as well as you know it. good luck with everything man, don't ever give up! Whoah, that menu & battle screen looks amazing. Hey guys! Quick end of year update! We set some challenges with some friends, and mine was to have a playable demo of my game. Regardless how broken it was . So finally someone that wasn't me, with a completely different mental model got to play my game, and I am happy to say I've made a big, nice list of needed changes, additions and simplifications to polish the first stage further. Game testing: you can't ever do it too soon! It works best if you either get to see the person playing, or you have a way to collect key data you are interested in. Wish you all a great 2014, and thank you for staying with me so far! Yes! After a lot of effort, I've done my homework and I am ready to share some of that with you. I am saving many of the survival mechanics I've been working on for later, to make one whole episode dedicated to it. On this opportunity, I talk on the progress being made, current status, future, and show you the Crafting, Compression, Repairing and Upgrading system that just got implemented. Oh wow this is simply amazing, love the whole boat and storm story (its always good to be trapped on a desert island). The Battle system and menu are gorgeous! I am loving this. That's really cool dude. This game just gets better and better. Hey guys! I wanted to share with you some quick updates. First, the name of the project will change. So stay alert! Main reasons are, I don't feel the name anymore, a game with this name already exists, but most importantly, I've redefined the course of the game. It will focus way more intensively in the survival in nature and the unveiling of new areas. There are so many mechanics to explore in pure nature survival that no other game really tackles (without eventually putting in some civilization technological advancements). And I really want to do that. So, there you go!. Second, my iMac has been on repair for almost two months. I am not in the US and bringing the spare pieces takes, well, months. Reason why I haven't been recording more videos. On the bright side, I focused on making a lot of progress with my laptop and I am proud to say, most mechanics have been implemented. This includes the new battle system (yea, it got better! ), feat tokens, hunting, fishing, cooking, weather affecting landscape, overall visual effects improvements, and a revamped user interface. Just to name a few, actually! There is more. Stay tuned, gameplay videos coming up in a few weeks. First off, notice Cognition has been rebranded to Unveil. Please do check the first post of this thread, as it has been edited to reflect all the new features and goals of the game. On that page, you will find the new video for the new YouTube page called Welcome to Unveil. Which I am attaching below. Follow this link, and don't forget to subscribe to stay up to date with the project! I will be posting more videos regularly now. Thank you for your support so far, and wish you all a very good day. Looks 10 times better with each update. You're systems are extremely extensive and well designed. I'm looking forward to getting my hands on a demo one day. Do you have any plans for changing the map style? Please please please go with a beautiful parallax method. Everything else is damn near perfect but when I see the maps it kills me. Of course they may just be test maps and place holders but I would love to see some rich mapping put to use for such a beautiful project. If mapping is not your strong point I would love to help out in any way I can. If you're interested, I can send you some screen shots or playable parallax maps I've made. It would up the production value of your project tremendously along side your amazing in game systems. Of course this is just my opinion and by all means I mean no disrespect. Let me know if I can help at all and good luck with the rest of your project. PS> I really like the new project name. I loved Cognition as well so I feel like you could call it 'Project Dog Spit' and I would still love it haha. Awesome work buddy. Keep it up. I can't wait to see how it all ends up! You're a motivation to us all. Hey Polidoro! Thank you for your kind works. I've been working hard day after day for the past months just to get the engine that I need going. Simulation layers, upgrades, battle system, crafting... each takes it's own time. So I appreciate the appreciation! Maps are indeed not final. I wished I could get custom tilesets, but am not sure about using a big image behind with the whole surface pre-rendered (having to then blindly block non-accessible areas on the editor). I wouldn't do that unless the game has been thoroughly tested, released, and there was nothing else to change (maintaining a parallax is several times more time consuming, which is scarce ). That'd work more for a "re-release", I believe. For the time being (unless I'm proven wrong), rather walk a middle path between good looks and fast debug loop. However, I definitely would love to see what you have been working on. I can always use some help. The project is quite ambitious! Please PM me your Skype, FaceTime, what have you. And we'll get in touch .